Cumbria is the second most sparsely populated county in England. Two thirds of all the county’s settlements have less than 200 residents and getting access to even some very basic essential services can be extremely difficult. The Northern Fells Rural Community Development Group offers support to local, vulnerable people who may be isolated and excluded from vital services across seven parishes – Ireby & Uldale, Boltons, Westward and Rosley, Sebergham and Welton, Caldbeck, Castle Sowerby and Mungrisdale. The charity received £4,500 over 3 years from the Joyce Wilkinson Charitable Trust to consolidate its Village Agents and Men in Shed projects. Four Village Agents, organise events and social activities in their parishes, and visit people at home to give energy switch advice, answer queries about benefits and residential care options and provide information and signposts to other services. They also give practical and emotional support to older people to help them live independently. 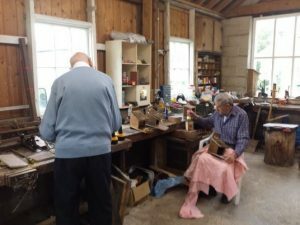 Men in Sheds works with older men, many of whom have onset dementia, providing a space twice a week for them to meet, share skills and recover sense of purpose. The workshop provides a community repair service and is increasingly doing odd jobs around the community. Projects have included garden furniture repair, a giant’s story chair for the local primary school, Christmas decorations and repair work on furniture for the local ‘cooperative run’ pub. The funding acted as match funding to a £175,270 grant from the Big Lottery, helping these projects to grow. The charity has since introduced a new transport scheme, providing a weekly bus to Carlisle, IT and iPad training for older people, free hearing aid checks, gentle exercise classes and an unexpected increase in people joining the walking group. Libby Graham, Fundraising Coordinator, said: “Residents face day-to-day issues like poor or no public transport, poor health and loneliness, and low incomes stretched by rising fuel prices. New people to the area and long term residents often don’t have family support networks. The initial project to tackle rural isolation was launched in November 1999 by Prince Charles, one of three schemes chosen nationwide for his Rural Revival Initiative. It was so successful it became permanent and today, the prince remains a loyal supporter of the work that the Northern Fells Group does.